Michael Mulgrew stood up at the New York Hilton in front of hundreds of UFT Delegates and said that bloggers trafficked in "myth." He fancied himself generous for calling us liars in a manner he deemed subtle. This, of course, was in response to blogs he claims not to read. Then he told us our health care wouldn't be cut. Let's be clear. In a way, those who say America has the best health care in the world are telling the truth. All you have to do is pay for the best doctors in the best hospitals, and you get the best care. You can have private rooms in hospitals. You can even have them bring all those machines to your home. You get what you pay for. And UFT members have a great deal of choice. The only difference, of course, is they will now pay more to exercise it. They need only reach a little farther inside their wallets, and they can have the same choices and level of care that they'd previously enjoyed. How much, exactly, was laid out over at the JD2718 blog. So let's be clear--it was not the bloggers who lied. This blog released a piece that a Capital NY reporter had gotten a hold of, a piece a UFT source later told me was rejected in negotiation. But it's pretty obvious that we still haven't got a paper contract, and we still don't know exactly which changes we will and will not see. Mulgrew rolled the dice and is hoping for the best, I suppose. At his salary, a few bucks here and there in co-pays won't make a whole lot of difference anyway. i. for fiscal year 2015 (July 1, 2014-June 30, 2015), CONTRACT AGREEMENT 2014 there shall be $400 million in savings on a citywide basis in health care costs in the NYC health care program. ii. for fiscal year 2016 (July 1, 2015-June 30, 2016), there shall be $700 million in savings on a citywide basis in health care costs in the NYC health care program. iii. for fiscal year 2017 (July 1, 2016-June 30, 2017), there shall be $1 billion in savings on a citywide basis in health care costs in the NYC health care program. iv. for fiscal year 2018 (July 1, 2017-June 30, 2018), there shall be $1.3 billion in savings on a citywide basis in health care costs in the NYC health care program. v. for every fiscal year thereafter, the savings on a citywide basis in health care costs shall continue on a recurring basis. vi. The parties agree that the above savings to be achieved on a Citywide basis are a material term of this agreement. vii. In the event the MLC does not agree to the above citywide targets, the arbitrator shall determine the UFT’s proportional share of the savings target and, absent an agreement by these parties, shall implement the process for the satisfaction of these savings targets. In case the implications are not clear enough, we've signed a blank check. GHI is a hugely popular program among city workers because it gives a great deal of choice, unlike HMOs. But now members who exercise this choice will have to pay more for it. There is simply no other explanation. Now I will grant Mulgrew is not a blogger. Our President cannot be called a blogger by any stretch of the imagination. He doesn't blog, and in fact he killed the only blog the union even had. He doesn't tweet, he doesn't do Facebook, and he doesn't even answer email. But however many self-satisfied smirks he affects, he lies right to our faces. This is indeed a degradation of health care, and those of us who find the now ubiquitous urgent care centers convenient will find them a little less so. And every single loyalty oath signer, likely as not your chapter leader, is bound to support those lies. We've signed a blank check and we have no idea whatsoever what further compromises will be made in our health care. And lest you forget, we did so only to have the money FDNY and NYPD got, the money they got with no givebacks, but to get it full of givebacks ,and a full eleven years after they did. We sacrificed the ATR teachers and left our health care in the hands of faceless and nameless bureaucrats. In return for this, we negotiated the lowest pattern increase in my living memory, 10% over 7 years, imposed not only on us, but on all our brother and sister unionists. This, my friends, is what Michael Mulgrew sold to the UFT. This is the deal for which he literally shut down opposition voices at the Hilton. 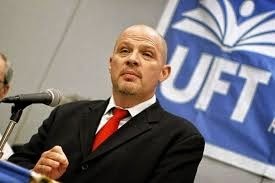 After years of nothing, UFT members were so desperate they voted for it. It's very sad that people were so beaten down they saw no alternative, and even sadder that they were sold it by Mulgrew's appeals to fear, e.g. there's no God-given right to retro, and we'll move behind 151 other unions if we don't just take it. A few facts are evident here. One is is it's hard to imagine any of the 151 other unions doing a worse job of negotiating than Michael Mulgrew and the people he constantly refers to as "very smart." Thus, we may indeed have been better off waiting.